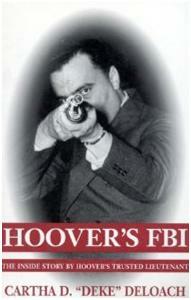 I just read Hoover’s FBI by Cartha D. ‘Deke’ DeLoach. An FBI agent for thirty years, DeLoach was the number three guy in the FBI and interacted with Hoover on a daily as well as personnel basis. The author was involved intimately with every little detail of the FBI and was so trusted that he even had a red phone by his bed that ran straight to President Johnson. Twice he was asked to become the director and each time refused, prefering to remain retired. Here’s a little bit I got from the book. This was surprising to me. I’m not a big fan of Hoover or the FBI (for no particular reason) and I ended the book without becoming a big fan of Hoover or the FBI (for no particular reason). It’s not that I dislike them. It’s jut that neither subject would be my first choice for a book. I was away far from home and it was the only thing I had to read. Two things did change my estimation of both. First, Hoover was an authentic tough guy. In his early career he was right there in the mix of it and he wasn’t afraid to ‘engage’ the bad guys. He was far from all talk. Everything he ordered his agents to do, he had already done. I like that in a leader. Second, the FBI did a bang up job on the JFK and Martin Luther King assassinations, finding the bodies of the three civil right workers murdered in 1964, breaking the KKK in Mississippi, and other high profile and disturbing cases. Like the young girl kidnapped and buried alive in a specially made coffin, which had been built by a MIT professor to keep her alive until he received his ransom money. The FBI found the girl, returned her alive to her parents, chased the bad guy to an island off the east coast, and then after an exhausting search flushed him into the water where he was captured trying to swim to safety, albeit rather weakly. All in all, these guys did some fine police work! I’m sorry to tell you this, but there was no second shooter on the grassy knoll. The author lays out a compelling case with tons of evidence all of which has been reviewed over and over again by dozens of commissions and teams of highly specialized professionals. I hate to say it…there was no second shooter. Oswald acted alone. Yeah, I know. Me too, I felt kind of cheated as well. Oswald was known to the FBI before he murdered JFK. Unbelievable! The FBI had a file on Oswald and the second he was identified as the killer; the FBI went into hyperactive mode trying to figure out if this had been a terrible case of coincidence or bad police work. In the end, it was just coincidence but I couldn’t help but suffer a feeling of déjà vu. The Boston murderers had been known, the shooter from Newtown had been known by the school, the Columbine murderers had been arrested before the attack, and the list goes on and on. These guys just don’t appear out of nowhere. They’re right there in front of our eyes and many times we’ve already interacted with them—just like Oswald. In the case of Oswald, he was being watched because he had tried to defect to Russia and because he physically threatened an agent over his wife being questioned concerning his behavior. Hoover was a cross dresser. What? This completely blindsided me. Am I the only guy who didn’t know? The author spends a lengthy part of the book completely dispelling these accusations and in the end I couldn’t help but believe him. There was just no evidence to think otherwise and Hoover didn’t seem like the kind of guy who would lead a double life. To wrap it up, I liked the book. I wouldn’t read it again, but I would recommend it to others. Especially, if you like history and want to know what life was like fighting crime and the KKK in the 1950-60’s. That part of the book was absolutely fascinating and full of details that only the author or those extremely close to the action could possibly know. If for nothing else, that made the read completely worth it. Categories: Book Reviews | Tags: Don Shomette, FBI, Hoover, Hoover's FBI, SRO Toolbox | Permalink. You’re nineteen years old. It’s the middle of the night. To the right and left are thirty other men, jammed in tight, shoulder to shoulder. The airplane you’re flying in stinks of moldy canvas, two day old sweat, and gasoline. There’s only one window but you can’t see out of it and the engines rattle as bad as pennies in a soda can. You can’t believe the thing is even able to fly. A small red light by the nose of the cabin burns bright and you fixate on it, waiting for it to turn green so you can get out of there. Before the war, you never even flew in an airplane let alone left your county where every person in your family has been born and raised. Now you’re thousands of miles from home going to a place you’ve only read about in history books. Suddenly, the other men on the plane stand up and so do you. You know what this means. General Gavins has instructed every man of the 101st Airborne to stand when he crosses into France, like a man would when confronted with danger. While you agree with this sentiment, you also know there is another reason. It’s going to get hairy and if you want to live, you better get out of the airplane as fast as you can. You’re loaded down with sixty pounds of gear and ammunition so you waddle into position. You stare at the red light—no change. Then comes the order to check equipment. One by one, the men scream their number and that they are ready. When your turn comes you yell, “Thirteen okay!” Of all the numbers to have on this night of nights, you think to yourself. In the distance you hear a pop and all the men collectively inhale. Through the open door, you can see bright lights twinkling in the night sky. Little at first, the explosions continue to increase until you’re right in the middle of it. The roaring is deafening as more and more streaks of moonlight burst into the airplane where the bullets have ripped a hole through the flimsy metal skin. One man goes down, and then another. You look at the red light, trying to will it to change to green but it doesn’t. A bright orange fire ball explodes and momentarily bathes the inside of your plane with light. That wasn’t flak—it was too big. The airplane flying beside yours just erupted into flames and pieces. It’s gone. They’re gone. You look towards the red light and you barely believe your eyes. It’s green. Every man still able to walk shuffles towards the door. It seems like forever, but in reality it only takes a few seconds for you to reach the doorway. It’s your turn. In the flash you take it all in. Too dark, too fast, too many enemies. You can’t see more than a few feet beyond the plane. Men who are nothing more than a blur whip past you on parachutes not built to withstand this kind of speed. The pilots are going too fast, but there is nothing that can be done about that now. Below you the enemy guns light up the countryside. They are everywhere—and that’s your drop zone. You turn your face from the stinging wind and the chaos that is all around you and then you do it. A leap towards evil. That’s how D-Day started. 69 years ago today, frightened but determined boys (most of them were just teenagers) leapt from the night sky towards evil. And yes, the Nazi war machine was absolutely evil. D-Day stands for Departure Day or the day that an operation is scheduled to begin. In military circles it has another and more sarcastic meaning. Death Day, since this is the day that the dying starts. All the men and women who sacrificed so much during World War II deserve our thanks and our never ending respect. Time may lessen our appreciation of their heroic efforts, but it can never diminish their accomplishment. They leapt towards evil. Amazing. Categories: General Posts | Tags: 101st, 6 June 1944, D-Day, Eisenhower, France., SRO Toolbox, The World War II D-Day invasion of Normandy | Permalink.